GLAD attorney John Ward became the first openly gay attorney to argue at the Supreme Court. More realistically, the first official challenge to the ban of LGBT groups from the parade came from GLAD over 17 years ago in the early 1990’s on behalf of the Irish-American Gay, Lesbian, Bisexual Group of Boston (GLIB). With many members of GLIB being of 100% Irish descent, they grew tired of the exclusion and with the help of GLAD, filed for a court order to allow them to march in the St. Patrick’s Day Parade for the first time in 1992. They continued this run through 1993, obtaining another court order for inclusion, until 1994 when the Veteran’s Council in charge of approving groups to march decided to cancel the parade outright, rather than allow GLIB to obtain a court order to march for the third year in a row. After this extreme action to cancel the parade by the Veteran’s Council, GLIB and GLAD decided it was time to take the case to the Supreme Court. In early 1995, the Supreme Court issued its ruling reversing the seven previous wins in Massachusetts, and maintaining that the Veteran’s Council had the right to make this exclusion. Despite the loss, the case itself created a few milestones of its own. GLAD attorney John Ward became the first openly gay attorney to argue at the Supreme Court. The written decision was respectful in tone, and acknowledged that coming out and being out are expressive acts. Now, 20 years after the Supreme Court ruling – LGBT groups are in the parade! But it is not without some slight discomfort that some groups be let in while others are still excluded. A small step has been made, this time by a cultural shift in understanding rather than a long-winded legal battle, but it may just be the stepping stone to actual full equality and inclusion. The LGBT group OutVets actually made an appearance in the St. Patrick’s Day Parade in 2014, which was cheered on by Mayor Marty Walsh, who boycotted the parade in 2013 as a result of the exclusion. This year OutVets was joined by Boston Pride as the two groups given permission to march. This year is a great step forward in the ongoing efforts for full inclusion. For more of that history, see the in depth look in the Rainbow Times at the history of the alternative St. Patrick’s Peace Parade, organized for many years by Veteran’s for Peace (VFP) and inclusive of the LGBT community. 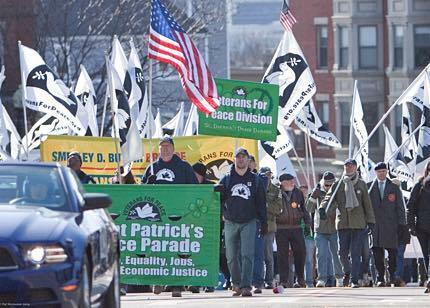 Pictured below, a photo of the Veteran’s for Peace marching in the 2014 St. Patrick’s Peace Parade. Hopefully, eventually any group LGBT related or not, will be able to take part in Boston’s St. Patrick’s Day celebration of heritage, remembrance, and fighting alongside one another for our place in this world, despite differences in our identities. Correction: an earlier version of this post stated that VFP held the St. Patrick’s Peace Parade this year, but that event was not held.